Bert Johnson You can drink wine by the glass or the bowl at The Punchdown. Bert Johnson $15 and $12 bottles of natural wine for sale at The Punchdown. In 2007, Lisa Costa moved across the country for a harvest internship at a renowned producer of single vineyard pinot noirs in the Russian River Valley. She had fallen in love with winemaking in her early twenties while working at small farm wineries in New York's Hudson Valley. The internship promised a chance to work with some of the most expensive fruit being grown in the United States. The experience was an eye-opener. "I couldn't believe what they were asking me to put in the wine tanks. I couldn't believe the chemical trailer they had in their backyard. ... And I couldn't believe what they were pulling over the consumers' eyes," said Costa, referring to the Sonoma County winery, which she declined to name. "I was offended by it. I was taking it kind of personally." Among the chemicals she encountered was sulfur dioxide, the most common wine additive. It has been employed to kill microbes and prevent oxidation for centuries, but the amount used by winemakers has shifted a bit since antiquity. "We were making these huge factory batches of wine, and you're faced with a total loss if you get some sort of bacteria in there," said Costa. "So you just overdose it. ... And that's not good for anyone." After working together at the Russian River area winery, Costa and her now fiancé, D.C. Looney, decided they wanted to do things differently. Today, the couple own the Punchdown (1737 Broadway), the recently re-opened natural wine bar and bottle shop in downtown Oakland. You won't find the kinds of big oaky wines that dominate grocery store shelves on their list. Instead, the menu includes a white wine from Georgia described as "stinky," an "aromatic" and "funky" French Muscat, and a "weird" orange wine from Spain. "Zero-zero," which indicates no added sulfur and no fining or filtration, appears next to several wines. Like other proponents of so-called natural wine, Costa and Looney believe that wine should be made with as little intervention as possible. Starting in the vineyard, this means no pesticides, herbicides, or fungicides. Grapes are tended by hand, often using organic or biodynamic (a system that views the vineyard as a living organism) farming practices. The juice ferments with native, ambient yeast rather than the lab yeasts employed by many large scale wineries. For Costa and Looney, native yeast fermentation is the most important part of natural winemaking. According to them, ambient yeast makes natural wines more distinctive and allows for a more accurate reflection of terroir, the unique flavor of a place that comes from its particular combination of soil, climate, and, well, yeast. As an example, Costa pointed to the Jura, one of their favorite wine regions in France. "The Jura has a very special wild yeast that only lives there. It's like San Francisco or New York sourdough. It can only survive in certain areas where the conditions are absolutely perfect. It can't be replicated anywhere else." Trusting that their grapes know what to do on their own, natural winemakers also do not add sugar, enzymes, bacteria, acid, tannins, water, coloring, or any of the other seventy-plus additives and treatments allowed by the US Alcohol and Tobacco Tax and Trade Bureau. Nor do they use reverse osmosis, micro-oxygenation, concentrators, or other high-tech tools that allow modern winemakers to engineer predictable bottles of wine. "The grape itself naturally has all the elements necessary to make wine," said Costa. "As long as you keep other bacteria from infecting it, you have wine that's basically made itself. No other fruit in the world does that — only grapes." While many consumers assume that grapes are all that goes into a bottle of wine, a typical recipe can read more like a chemistry experiment. However, unlike processed foods, winemakers are not required to list ingredients on their labels. Those unmentioned additives can include diammonium phosphate (DAP), used to revive yeast and inhibit sulfur production; Velcorin (dimethyl dicarbonate), a microbial control agent; Mega Purple, a viscous goo that boosts color; and oak chips or oak sawdust, a cheaper alternative to oak barrels. Costa likens the difference between natural wine and mass-produced wine to the difference between handmade bread and Wonder Bread. "Often when you're baking sourdoughs, you're dealing with natural yeasts, and you're dealing with a very natural, hands-on process that's hard to have a recipe for," she said. On the other hand, "You can make Wonder Bread taste the same year after year." "A lot of wines are manipulated to taste the same way to satisfy what some people call the 'Coca-Cola palate,'" said Costa. "Everyone likes something sweet and fruity, but you get tired of those flavors after a while, and you start to look for something new." 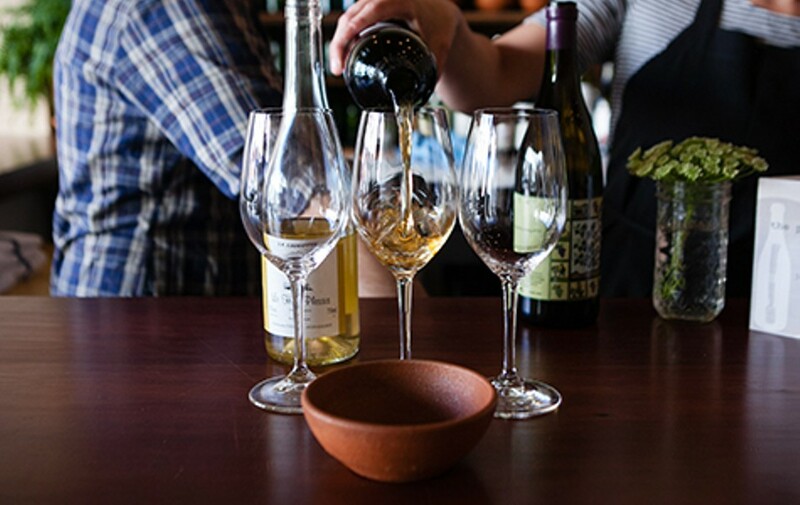 Although the East Bay is ripe with organic, farm-to-table food choices, natural wines are still hard to find. "There's a major disconnect between a lot of the local chefs who are into the organic movement," said Looney. "They're serving organic foods on the plate, but when it comes to wine, they're deviating from the integrity they have for their other ingredients." The thirtysomething couple is hopeful that as their generation becomes curious about what is actually going (or not going) into their wines, interest in natural wine will grow. 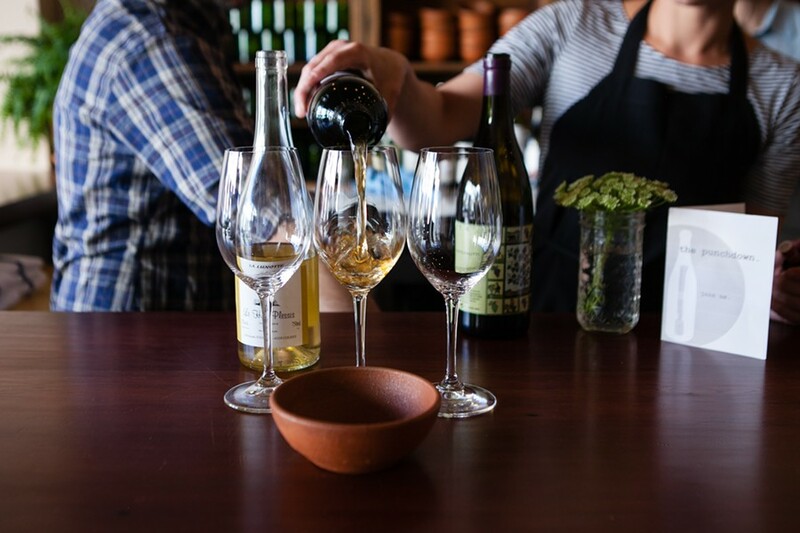 Oakland is already home to another wine bar and shop, Ordinaire (3354 Grand Ave.), as well as natural winemakers, such as Donkey & Goat, Broc Cellars, and Dashe Cellars. 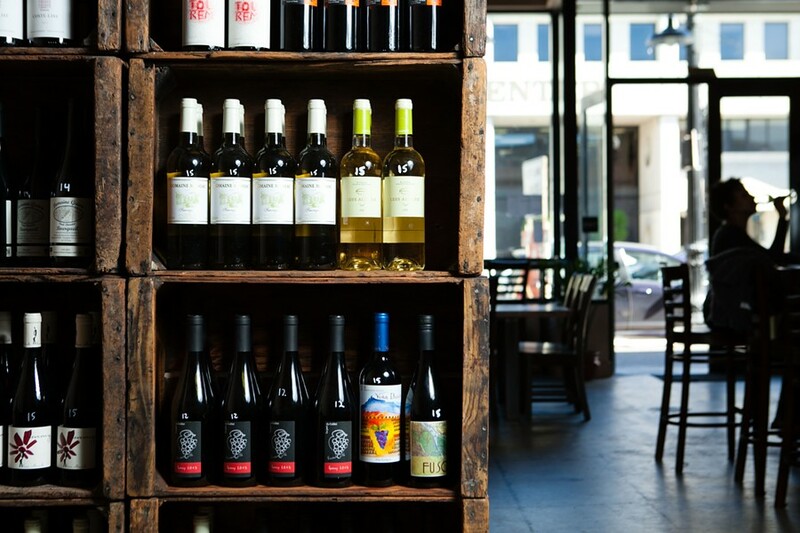 Some restaurants are starting to offer natural wines, too. Looney names Chez Panisse, The Ramen Shop, Kronnerburger, À Côté, Camino, Salsipuedes, and The Half Orange as standouts. "You know, we're all growing up and we want to drink a little bit," said Costa. "And we prefer to not feel badly about it."